Arena Birmingham will welcome the brilliant new show from Disney on Ice, Dream Big, in October 2018. With on average two tours a year, the autumn/winter season is a firm favourite amongst Disney fans and this new show features some amazing princesses and heroes. With characters from Frozen, Moana, Beauty and the Beast as well as a 90th birthday celebration for Mickey Mouse is going to be a brilliant show. Dream Big tickets for Birmingham go on general sale Friday 29 June, check with Ticketmaster, See Tickets and the official ticket site for the arena Ticket Factory. Disney on Ice bring their latest ice dancing feast ‘Dream Big’ to Manchester Arena. With me additions to the show like Moana it’s going to be an amazing event, packed with incredible dance routines, magnificent costumes and all your favourite Disney songs. Newcastle upon Tyne Metro Radio Arena will host the latest Disney on Ice spectacular ‘Dream Big’ in October 2018. A firm favourite at the arena, Disney on Ice have been touring and playing on Tyneside for years, and every show or a guaranteed hit with the family audience. This new show features a special 90th birthday party for the original Disney favourite Mickey Mouse, as well as characters from Frozen, Moana and loads more. Disney on Ice return to the Braehead Arena Glasgow in September 2018 with a brand new show ‘Dream Big’. 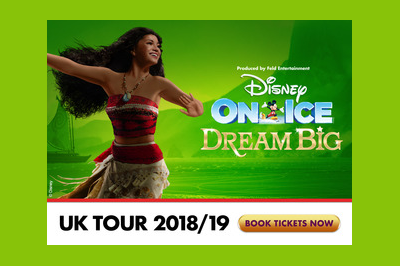 The incredible world of Disney comes to life on the ice, featuring some of your favourite characters from Frozen, Beauty and the Beast, Tangled, Cinderella and for the first time Moana. Disney on Ice return to the UK with an incredible new show for Autumn Winter 2018/2019 called Dream Big. Courage leads the way for Disney’s most adventurous dreamers at Disney On Ice presents Dream Big. Join fearless Moana and the greatest demigod that ever lived, Maui, on an action-packed voyage to restore the stolen heart of Te Fiti. Let your hair down with Rapunzel, travel on an epic journey of sisterly love with Anna and Elsa, and follow your heart along with Cinderella, Aurora, Jasmine and Belle. Plus, arrive early to join a special 90th birthday celebration in honour of Walt Disney’s true original, Mickey Mouse. High-flying jumps, breathtaking skating and lovable Disney friends make Disney On Ice presents Dream Big an experience your family will never forget. 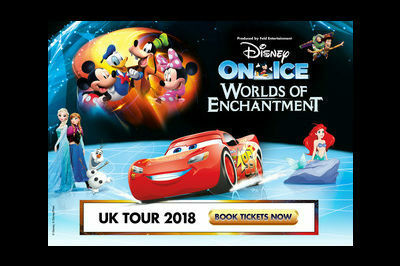 Disney on Ice present Worlds of Enchantment at the Liverpool Echo Arena in April 2018. Another fantastic family show packed with your favourite Disney songs matched with brilliant Ice dancing routines and fabulous costumes and sets. Worlds of Enchantment is set to bring characters from Frozen, Cars, The Little Mermaid, Toy Story as well as Mickey Mouse, Minnie Mouse, Donald Duck and Goofy to Liverpool’s arena venue. Disney on Ice Worlds of Enchantment is the early 2018 show coming to Cardiff. The ice skating spectacular is a massive hit with families every season and this show is expected to be another winning combination of dazzling routines, memorable Disney songs and brilliant costumes. The show at Cardiff Motorpoint Arena is booking for performances from Wednesday 25 April through to Sunday 29 of April 2018, with matinees also scheduled for the weekend dates. Children under two years of age can attend free, as long as they are sat on a ticket holding adult’s lap. Returning to the cities Motorpoint Arena in April, Disney on Ice will pack in some of your all time favourite characters from classic films like Cars, Toy Story and Frozen. Worlds of Enchantment tickets go on general sale on Friday 20 October 2017. 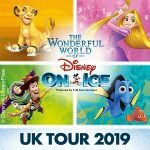 Birmingham Genting Arena hosts the latest Ice skating show from the Disney on Ice team, Worlds of Enchantment in 2018. 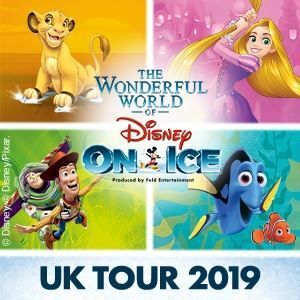 The celebrated events have been running in the UK for a number of years and are always brilliant family entertainment, packed with thrilling ice dancing routines with the very best Disney songs and characters. With favourites from Frozen, Toy Story, Cars, The Little Mermaid and many more, Worlds of Enchantment will be another smash hit. Disney on Ice bring their latest Ice dancing spectacular to the SSE Hydro Glasgow in 2018. Based around the concept of Worlds of Enchantment the show will feature loads of your favourite Disney characters from the likes of Frozen, Toy Story, Beauty and the Beast and plenty more.